Monarch, a 406-ton side-wheel towboat built at Fulton, Ohio, in 1853, was converted to a ram in 1862 for Colonel Charles Ellet's U.S. Ram Fleet. During Battle of Memphis on 6 June 1862, she rammed the Confederate ships Colonel Lovell and General Beauregard and helped pursue the fleeing Confederate ram General Earl van Dorn. During the rest of 1862 Monarch was active in the Yazoo River and the Mississippi above Vicksburg. In January 1863, Monarch participated in the expedition to capture Fort Hindman, Arkansas. She then conducted further operations on the Yazoo and along the Tennessee rivers. She was placed in reserve when Ellet's Mississippi Marine Brigade was disbanded in mid-1864. Monarch was sunk by ice while laid up in December 1864 and was later broken up. This page features our only views of the U.S. Ram Monarch. "Colonel Ellet's Ram Fleet on the Mississippi"
Line engraving after a sketch by Alexander Simplot, published in "Harper's Weekly", 1862. Ships in the foreground are: Monarch (letter "M" between stacks), Queen of the West (with letter "Q") and Lioness(letter "L"). In the left background are: Switzerland (with letter "S" on paddlebox), Samson and Lancaster. Note cotton bales stacked on deck to protect boilers. In the foreground, the print depicts the Confederate ships (from left to right): General M. Jeff Thompson (shown sinking); Little Rebel (shown burning); General Sterling Price; General Beauregard (shown being rammed by the Ellet Ram Monarch); General Bragg (shown aground) and Colonel Lovell (shown sinking). In the background are the Federal warships (from left to right): Queen of the West; Cairo; Carondelet; Louisville; Saint Louis; a tug; and Benton. Courtesy of the Naval Historical Foundation. 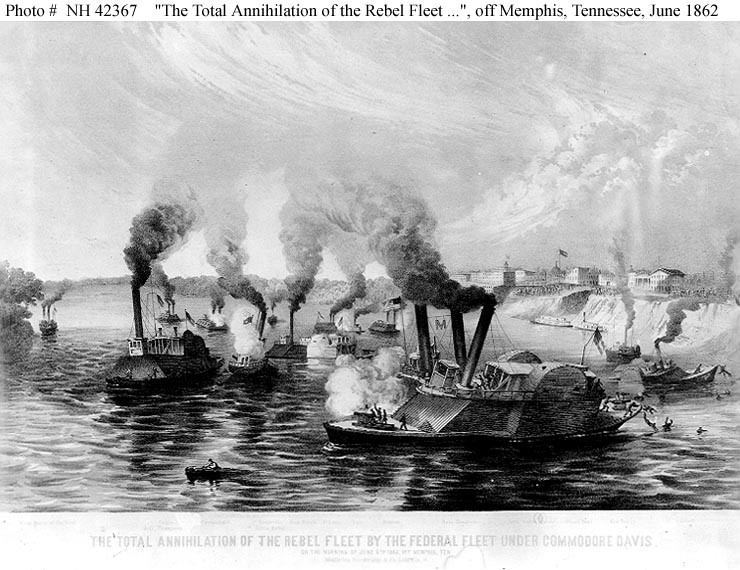 "The Great Naval Battle before Memphis, June 6, 1862"
Engraving after a sketch by Alexander Simplot, published in "Harper's Weekly", depicting the action between the Confederate River Defense Fleet and Federal warships off Memphis, Tennessee. In the center foreground the CSS General Beauregard is being rammed by the Federal ram Monarch. At left are the disabled Federal ram Queen of the West and the Confederate ships General Sterling Price and Little Rebel. Other Federal ships are in the center and left distance, with other Confederate ships in the center and right middle distance.